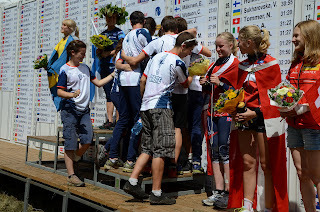 To really make a Europe trip economical, most national team members (and Canadian orienteers in general) link up multiple races and craft and entire summer Europe tour. Several members of the team headed up to Sweden for O-Ringen. A few of the American team members were going to Croatia. 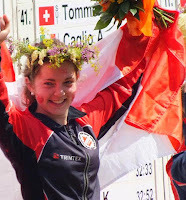 This year I chose to travel back to the UK after the World Championships and participate in Croeso 2012, also known as the Wales 6-Day, in Aberystwyth. It took an epic travel day to get there, going from Lausanne to Geneva to London Luton to Coventry to Brimingham to Aberystwyth. Aberystwyth is a lovely town on the west coast of the UK on a lovely coast line of rolling hills and cliffs, and even beaches, though I didn't have the courage to get in the water. I am told it wasn't actually all that bad. Ha Ha! Victory is mine again! I actually started to claim that most Brits were just making all that rain up, since I experienced not a single drop of raining, and warm temperatures with nothing but sunshine. Take that, fate! The terrain for these races were generally open hill side, with plenty of marshes, big hills, and quite a few rock features. It is seemingly pretty easy, because you can see quite far, but it is also easy to mistake one smaller hill for another. If you can stay in touch at all times, it can be quite smooth, but relocating when everything looks the same can prove to be a very challenging task. And, like many other countries, I saw quite a few intensive meetings between competitors, trying to figure out where on this vast hillside they were. Day 2 (my first race) was probably my best, placing 7th in M21L - below is an image of my course with my route drawn on it. You can also compare it to my GPS track at my Orienteering Map Archive . Its mildly interesting to compare my mark of where I thought I went, to where my GPS says I went. I feel that is mildly concerning given it means there were extensive lengths of times where I clearly was way off in where I thought I went. Though I avoided the fate of tons of rain, it appears as though it caught up to me physically. As Day 3 rolled around my allergies started kicking in with a vengeance. I have never experienced a race while heavily allergic, sneezing and eyes tearing and nose running. Needless to say, my middle on Day 3 did not go remarkably well, making a few too many mistakes and not really feeling the fitness love. I had a bad misstep in Day 2 that also caused some intensive toe swelling. Look up, look waaaay up. The start is on that skyline over there. After a rest day and Day 4, my cold was getting aggressive enough that I was quite tired and being pretty stupid. Multiple falls caused more bruising on my legs, and I started to hate orienteering. This is, of course, the double-edged sword of month long Europe tours. Its really hard to keep the motivation up and the fatigue down, and at this point after so many races and training in so few days, my enthusiasm has drained to nothingness. So, I decided to call it after the 3rd race, and take an early train back to Coventry. Now, it is time for 2 weeks of intensive Olympics watching. I saw Canada defeat South Africa 3-0 at the Coventry Stadium, and we have just bought train tickets to watch next Saturday's women's triathlon in Hyde Park in London. I am expecting big things from Edmontonian Paula Findlay. Then its back to Edmonton to prepare for the Nationals. With luck a few weeks of only running training will get me back in the spirit. Shameless plug: I hope everyone comes to the HPP Fundraiser knock-out ultrasprint on the grounds of the Alberta Legislature. 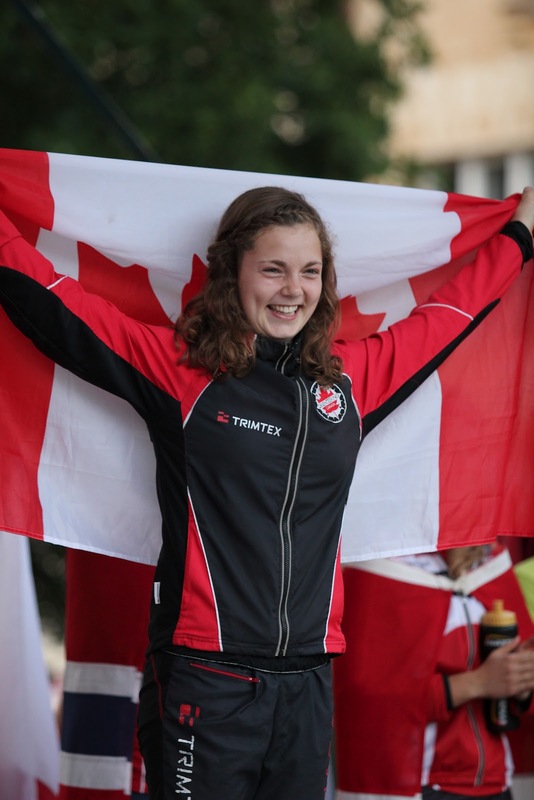 A first for Canadian orienteering! First of all, I would like to send out a spectacularly ginormous thank you to everyone for the support and congratulations that I have received. The texts, emails, Facebook and Attackpoint messages; it was quite honestly over-whelming! I was so touched that I just didn’t know how to react. When I finally got to the truth of my tongue-tiedness I realized that it was because I felt it was just an ordinary long distance race. I had made mistakes like many of the other girls did that day and my legs were feeling far from speedy. 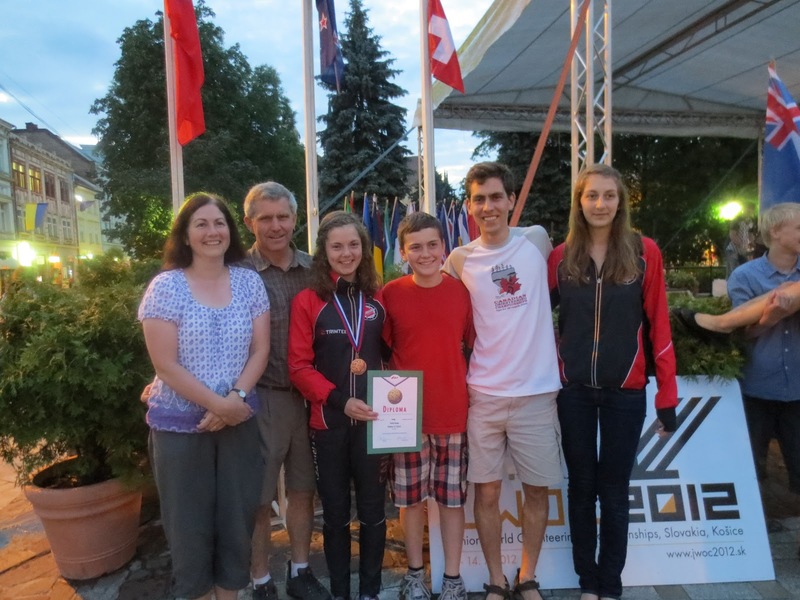 The most fabulous and thundering Canadian cheering squad at JWOC! 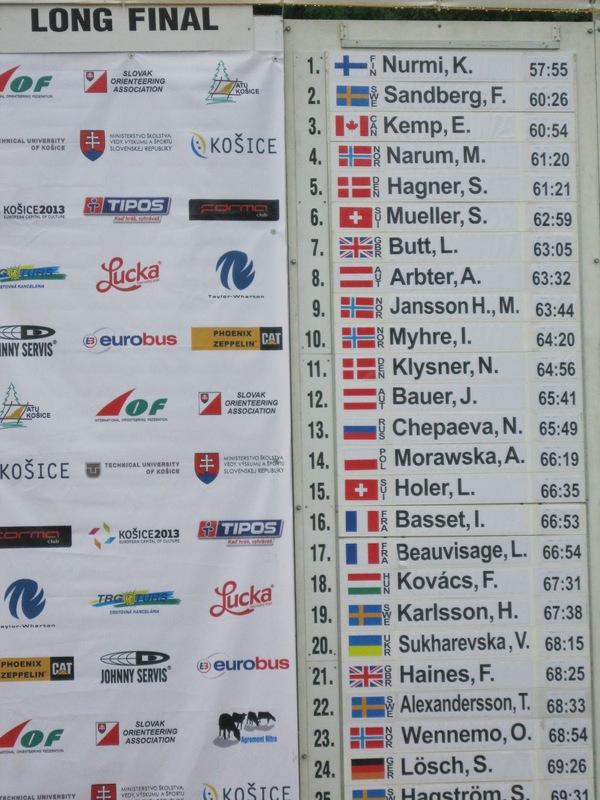 Let me talk about that fateful afternoon in a lonely part of Slovakia where 139 strong women from around the world were battling it out for those top spots. 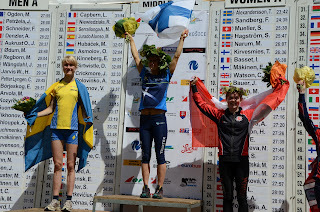 Leading up to the long distance I had mixed feelings of confidence (since I had already run on similar terrain with the French team back in May) but also of dread since my preparations hadn’t gone as planned due to developing tendinitis in my knee just 2 weeks before the start of JWOC. At the call-up line I had my goals in my head, I knew that this was it, and my face was just one huge grin. However, the course setter was a sneaky one, and he hit us with climb, but I mean climb that you would just not believe! As I looked up and saw the seemingly endless steep slope of the hill stretching before me I remember thinking “am I really walking during a world championship? Emily! Have some dignity! !” I was only on my way to the third control and I felt exhausted! Next came the reason why they call this the long distance race: the super long route choice! I had practiced this though! I knew to look for the best attackpoint, even if it was a bit of a detour, it was always better than battling through the green. From the small indistinct trail leading to 4, I knew I had to get on that huge trail running east, and from here to there, it was just a matter of doing a bit of fancy footwork through the depressions. Things were actually going really smoothly, until I started running in the open yellow on the way to 6. I guess in this situation I could say that… disaster struck! Now I don’t want to start making excuses for losing 4 minutes on this control but I can still remember all of the thoughts running through my head. “Holy macaroni! It’s raining buckets out here! At least it’s cooling me off. It would be a shame if I got hit with lightening though”. That’s how it always happens; we’re in contact with the map one second, and the next we have no clue which depression we’re supposed to be running to. I did actually manage to get to the right one, but the fact that there was a Czech girl with the same hopeless look on her face and that I could see no distinct tree down in the bottom of the depression meant that I was doing some serious doubting! I could feel the seconds ticking away and my first thought was to panic but the hours of relocation training that I have done over the years have taught me that in this sort of situation the best thing to do is to just bail! I ran back about 100m to the last place where I knew exactly where I was to make sure that I was more confident before eventually heading back to that same depression. And tadaaa! There was my elusive control. My first thought was "that is NOT a distinct tree, it's a shrub!" But my next thought was "let's get this show back on the road!!" From there I had enough adrenaline from the raging storm as well as my raging brain that I managed to put everything out of my mind so that I could get back into this race. From 9 to 10 it was exactly like all the training exercises we had done in May; find the crest along the hills and then book it! Nothing is more exhilarating than running full speed in the most wide-open woods that you could imagine knowing exactly where your control will be. There go controls 10 and 11 and I am cooked! My legs feel like they’re made of Jell-O and my brain resembles scrambled eggs. It took me a split second to decide to take the safer route around and I gave it everything I had; as I ran into the finish chute, though, I felt like it wasn’t enough. I couldn’t discern the loudspeaker over the din of everyone cheering but when I heard that it was a third best time I could absolutely not believe it! 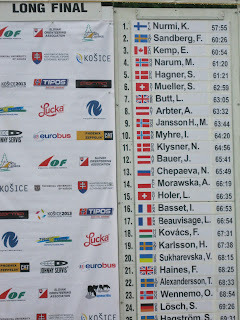 I was even harder to believe when my name together with our Canadian flag stayed in third place up on the results board and Sim (the coach from the French team) came running over to tell me that I had done it! It was official! I’ve had a good few weeks to mull over it and I really think that winning a race doesn’t mean that you pulled that perfect race out of a top-hat. It means that since you have made that race one of your major goals you have trained like a real winner. That means that you have chosen a challenging training plan and you have stuck to it through the good sessions and the sessions where you thought you wouldn’t make it. I, for one, have had my fair share of those. Memory-o at night in the winter… who comes up with that? Weeks with almost 17 hours of orienteering training… are you crazy? A good race doesn’t happen because you want it to, or because “it’s time”. 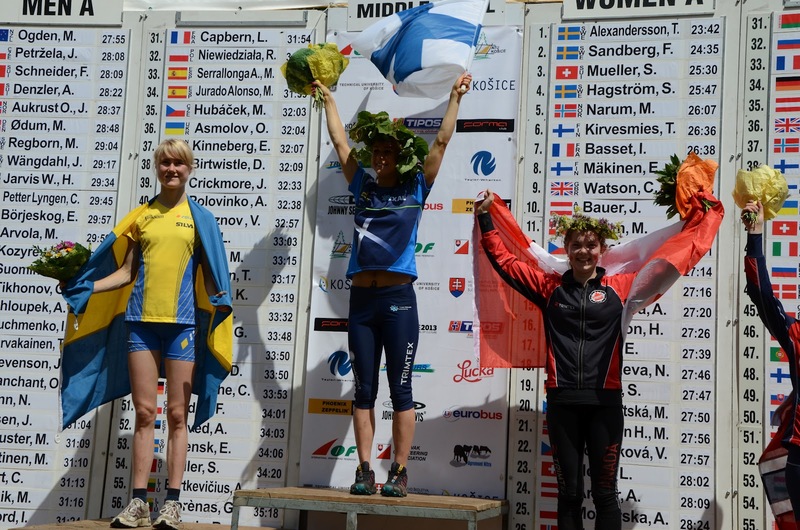 A good race happens because you have trained so hard that even your bad races can be compared with the times of the best orienteers around the world. After gaining so much racing experience I have also realized that “il ne faut jamais baisser les bras” (the French expression for never throwing in the towel) no matter what silly mistake you have just made. I also have a humungous thank you for my French coach in St Etienne, Olivier, who wouldn’t let me out on a training if I didn’t have a technical goal in mind. There’s a sentence that Benoit, the other French coach, said to me after the above mentioned night memory-o. I was telling him how difficult it had been out there and how frustrated I was but all he said was “well, that’s what makes you strong”. And I feel like I have been strong. It wasn’t easy packing up my life, leaving my friends and family and moving to a whole different country to study in a different language. Many tears have been shed into my pillow but I don’t think that I have enough tears to balance out the amount of joy that I have gotten since moving. France is my second home and the French my second family. They say that I am a ray of sunshine but that’s only because I absolutely love training with them and because I can’t contain my smile when I’m out doing what I love best. Winning this bronze medal was just a step towards my real goal but I hope that it was the best gift that I could give to everyone in North America and in France. I wanted to show that I wasn’t there just to eat baguette and that all their hard work and dedication wasn’t for nothing. I have never been so proud to be Canadian as when I saw our great flag rise with those of Sweden and Finland during the medal ceremony. I was practically in tears. I want to thank each and every one of you from the bottom of my heart for being there for me for every step of the way to one of the proudest moments of my life. There’s a piece of this medal for all of you. I’ve got big hopes for this coming year in France although for now I have to be content with sipping lemonade and reading novels on the porch of the family cottage. Sometimes we fall, we may break a bone, but that’s not going to stop me from picking myself up, dusting myself off and getting back into the woods when the doctor allows it. I hope that I’ll see most of you out at the COC’s! It may not be out in the woods but I’ll at least be returning the favour of cheering you all on in the finish chute. Announcing the 2012 WOC Men's Relay Team! Louise comes 33rd in the Long Distance! Coach Magnus talks about long final and relay! Louise 41st in Middle Distance Final! Louise qualifies for middle final! JWOC Long Bronze for Canada! Look forward to JWOC Sprint! WUOC Relay ~ end to a great week! Team Canada for JWOC 2012! WUOC Middle & looking forward to the Relay! 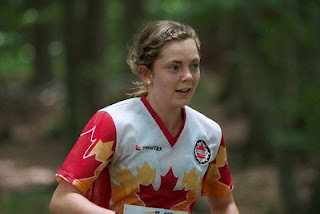 WUOC Sprint & looking forward to the middle! 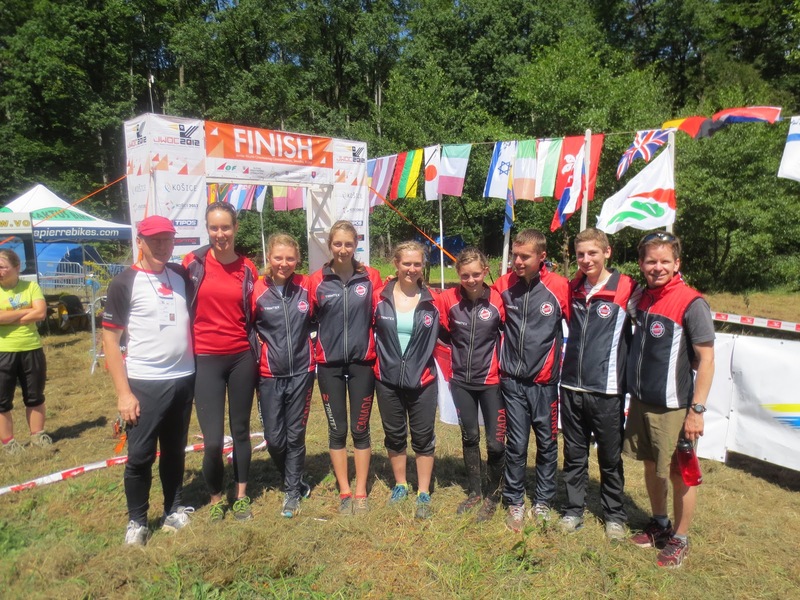 First Update from JWOC in Slovakia!